One of Photoshop CS6 new features is the option to add your custom shape a dashed or dotted line and even customize one of your own! Lets see that cool feature more closely. 01. Create a custom shape, set the fill to no fill or color, then add a stroke of any color and and also set the size of the stroke. 02. 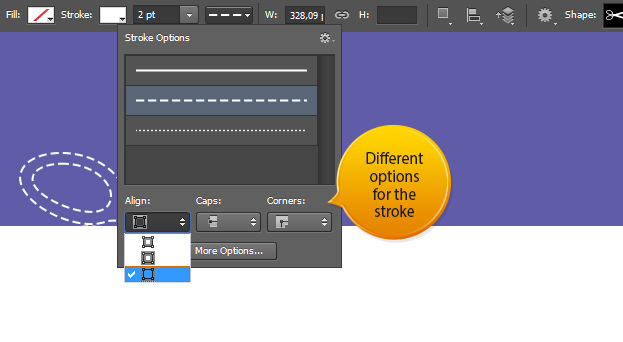 After that, you can set the stroke type by clicking on the lined options. There you will see a set of dotted lines. One click to any of those will immediately change the stroke type. 03. There are also other options to choose from for your stroke. For example Align options where you can set the stroke position either outside, center or inside of your shape. 04. If you want to make your own custom line, just click on the More Options button. A small window will open. There you can set the size of your dashes and gaps. 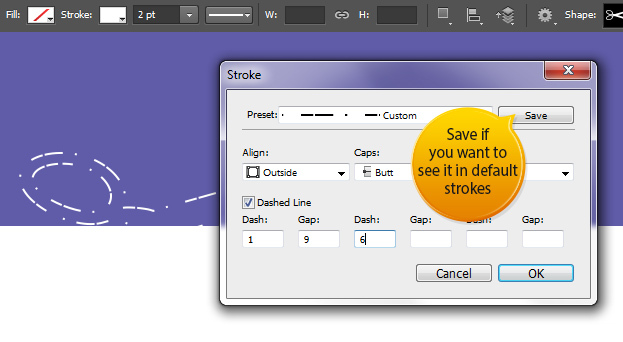 Press Ok to confirm changes, press Save if you want to save that stroke to the stoke list so you could use it also in the future with just one click. 05. And now you know hot to use the dashed or dotted strokes inside Photoshop CS6.